Other speakers will include actors Julie Hesmondhalgh & Sally Lindsay, music from the ska legend Rhoda Dakar who sang on a number of Specials hits, plus unions, health workers, and campaign representatives from across the country. It is almost 70 years since the NHS was founded by a Labour government and it’s still our proudest achievement. It was the first comprehensive health service in the world built on the principle that healthcare should be available to all on the basis of need, not ability to pay . What the Conservatives have done to our NHS, first under David Cameron, and then Theresa May, is appalling. Deliberate underfunding of services, and squeezing the pay of our brilliant doctors, nurses and health staff, has pushed our NHS to the brink. Every day there are shocking stories of unacceptable waiting times, ambulance delays and patients left on trolleys in corridors. And they’ve spent years selling off and contracting out our NHS bit by bit, leaving the NHS to be sued by private companies, like Virgin. Labour will end privatisation because our NHS should be about healthcare for all, not profits for a few. Book with mozgreenshields@gmail.com or text 07889 274723 as quick as you can. Participants are invited to bring colourful placards or banners and to dress in bright colours or costumes associated with any of the decades the NHS has been in operation. Sound systems will play music from each decade since the NHS was founded throughout the march route. This entry was posted in Austerity in UK, Conservatives, Defend NHS, Defend our Unions, Derby People's Asembly, LibDems Quislings, NHS Mental Health, NHS SOS, peoples assembly against austerity, Save the NHS, Solidarity, The People's Assembly Derby and tagged Conservative Party Paymasters, Conservative Party Vampire Squids, Derby, Derby People's Assembly, Derby People’s Assembly against Austerity, DERBYSHIRE, KEEP OUR NHS PUBLIC, Mental health, National Health Service, NHS, NHS Mental Health Crisis, NHS SOS, PRIVATISATION OF NHS, Solidarity, STOP NHS PRIVATISATION, STOP PRIVATISATION OF THE NHS DERBY. With no promised increase in social care funding any funding increase for the NHS will have limited benefit. Social care has suffered from extremely damaging cuts over the past eight years and this has adversely impacted the NHS. Social care cuts have cause caused real suffering and an increased mortality rate in those who are directly affected. Any new funding settlement for the NHS requires increased funding for social care. Think-tank estimates argue for a 3.9% annual uplift in real terms for social care. There should be no pretence that “integration” of health and social care, without extra funds for both, will solve the problems of either service. True integration will require social care to be brought into the NHS as a public service and to be properly funded. This entry was posted in Derby, DERBYSHIRE MENTAL HEALTH, Keep Our NHS Public, Mental Health, NHS, NHS Mental Health, NHS Mental Health Crisis, NHS SOS, peoples assembly against austerity and tagged Conservative Party Paymasters, Conservative Party Vampire Squids, Derby, Derby People's Assembly, Derby People’s Assembly against Austerity, Derby Trades Council, DERBYSHIRE, KEEP OUR NHS PUBLIC, Mental health, National Health Service, NHS, NHS Mental Health Crisis, NHS SOS, PRIVATISATION OF NHS, Solidarity, STOP NHS PRIVATISATION, STOP PRIVATISATION OF THE NHS DERBY. The People’s Assembly has teamed up with a huge coalition of unions, campaigns and organisations which will be hosting a massive celebration and national demonstration to mark the 70th anniversary of our NHS this year. On Saturday 30 June in Central London tens of thousands will join a parade of music, protest, carnival and street party. Make sure this is one event you don’t miss out on this year! #OurNHS is a loved and cherished part of every community. Come out and celebrate with us on 30th June. Bring your family, your friends, your loved ones and anyone who cares about the future of healthcare in this country. The NHS belongs to us. Access to healthcare is a human right. Our post-war generation created a National Health Service that delivered world class care to all on the basis of need. For 70 years #ourNHS has set a shining example to the world of what can be achieved when we make the choice to look after the collective good. But #ourNHS is under attack. A decade of austerity, underfunding and top down reforms have stretched our health service to breaking point. Services are being cut and cancelled, hospitals and wards are closing, there are staffing shortages across every part of the system and increasing parts of our health service are being outsourced to private companies. Never has there been a more urgent time in her 70 year history to stand up and defend what is yours. For what the last generation built. You have paid for it. You deserve it. Transport being arranged across the Country we will post details soon. This entry was posted in Austerity in UK, Conservatives, Defend NHS, Fight the Cuts, Inequality, LibDems Quislings, Save the NHS, Solidarity, The People's Assembly Derby, X Conservative Party Paymasters and tagged Austerity Fight The Cuts, Conservative Party Paymasters, Conservative Party Vampire Squids, KEEP OUR NHS PUBLIC, Mental health, National Health Service, NHS, NHS Mental Health Crisis, NHS SOS, PRIVATISATION OF NHS, Solidarity, STOP NHS PRIVATISATION, STOP PRIVATISATION OF THE NHS DERBY. 300,000 people on low incomes missing out on the benefits they’re due. Get in touch, we all need to do our bit to help defeat austerity, defend the NHS and begin to invest in people and services. Still a political choice to cut and destroy rather than protect, invest and build for the long term. There are alternatives. This entry was posted in Austerity in UK, Conservatives, Fight the Cuts, Inequality, LibDems Quislings, Solidarity, The People's Assembly Derby, X Conservative Party Paymasters and tagged Austerity Fight The Cuts, Conservative Party Paymasters, Conservative Party Vampire Squids, Derby, Derby People's Assembly, Derby People’s Assembly against Austerity, Fight Austerity, KEEP OUR NHS PUBLIC, Mental health, National Health Service, NHS, NHS Mental Health Crisis, NHS SOS, PRIVATISATION OF NHS, Solidarity, STOP NHS PRIVATISATION, STOP PRIVATISATION OF THE NHS DERBY. Join the demonstration in London On Saturday 3 February. Our NHS is in a serious crisis. Ambulances queuing for hours to hand over seriously ill patients, patients left in corridors waiting for beds, operations postponed, and mental health patients taken hundreds of miles to find a bed. 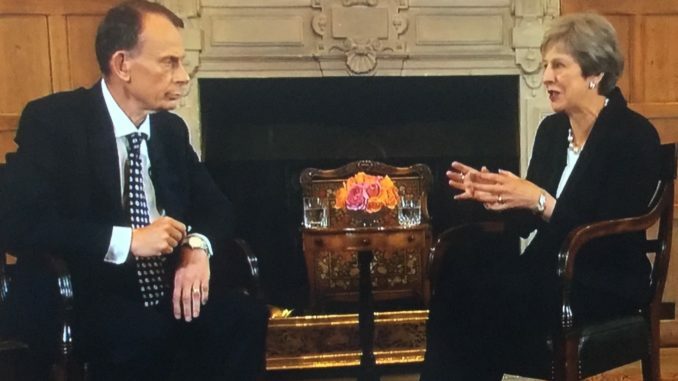 Theresa May & Health Secretary Jeremy Hunt issued a hollow apology and deny any crisis! But the problem comes from deliberate government policy of cuts, bed closures, pay restraint and privatisation. Our NHS has been starved of funding with inadequate investment in staff and resources. 8,000 front line beds and 20% of mental health beds have closed. Eight years of below inflation pay settlements have contributed to 100,000 vacant posts for health professionals – leaving no spare capacity for peaks of demand & increasing the pressure on the dedicated staff who remain. We don’t want apologies, we demand change. Coaches are leaving Derby Bus Station at 8:00am. Book tickets from mozgreenshields@gmail.com or text 07889 274723. Tickets are £10, £5 concessions, and free for the unwaged. 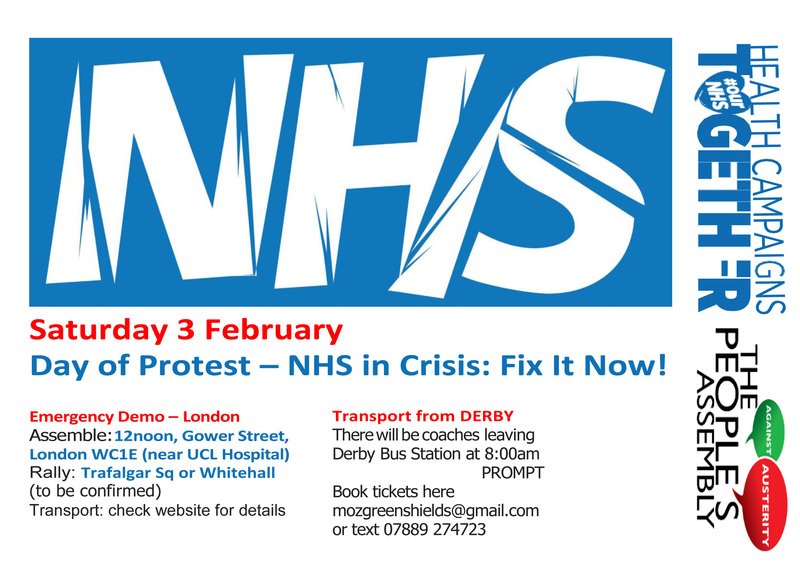 SOS NHS DERBY is asking all our supporters to come along. Coaches are leaving Chesterfield Town Hall, Rose Hill, S40 1LP) at 8:00am. Phone or text 07778480484 to book a seat. Protest and present the ‘protect the 535 beds’ petition to the County Council on Wednesday the February 7, 1.30 pm. Don’t forget that supporters from across Derbyshire will be attending the Derbyshire County Council Full meeting on Wednesday 7th February, at County Hall, Matlock, at 1.30 pm. Copyright © 2018 SOS NHS Derby, All rights reserved. Thanks you for giving us your email address when you signed the 535 beds petition, you can unsubscribe anytime that you wish. We urge that you stay connected with us because there are lots of things to do in our campaign to save the NHS. This entry was posted in Austerity in UK, Conservatives, Defend NHS, Fight the Cuts, Inequality, LibDems Quislings, Save the NHS, Solidarity, The People's Assembly Derby, X Conservative Party Paymasters and tagged Conservative Party Paymasters, Conservative Party Vampire Squids, Derby, Derby People's Assembly, Derby People’s Assembly against Austerity, DERBYSHIRE, Fight Austerity, KEEP OUR NHS PUBLIC, Labour, Mental health, National Health Service, NHS, NHS Mental Health Crisis, NHS SOS, PRIVATISATION OF NHS, Solidarity, STOP NHS PRIVATISATION, STOP PRIVATISATION OF THE NHS DERBY, Stop Privatisation Student Debts, Stop the Cuts, WELFARE. – NHS in Crisis: Fix It Now! This entry was posted in Austerity in UK, Conservatives, Defend NHS, Fight the Cuts, LibDems Quislings, Save the NHS, Solidarity, The People's Assembly Derby, X Conservative Party Paymasters and tagged Derby, Derby People's Assembly, DERBYSHIRE, Fight Austerity, Fight the Cuts, KEEP OUR NHS PUBLIC, Mental health, National Health Service, NHS, NHS Mental Health Crisis, NHS SOS, PRIVATISATION OF NHS, Solidarity, STOP NHS PRIVATISATION, STOP PRIVATISATION OF THE NHS DERBY, Stop Privatisation Student Debts, Stop the Cuts.